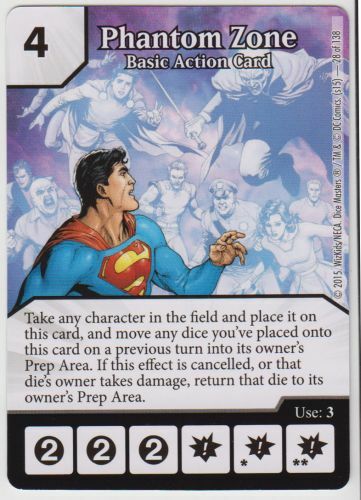 This card states "Take any character in the field and place it on this card, and move any dice you've placed onto this card on a previous turn into its owner's Prep Area. If this effect is cancelled, or that die's owner takes damage, return that die to its owner's Prep Area." On boardgamegeeks forum someone stated that means if I select Aquaman then my opponent loses all their Aquaman dice to the Phantom Zone. Is that really how it is? We've been playing it like each dice (whether its repeated) is its own person so we would send just one Aquaman to the Phantom Zone. Also can I use 2 Phantom Zones in one turn? so I send one character to the Phantom Zone and then use another. So the first one ends up in the Prep Area and the second remains in the Phantom Zone. This is one of several cards where it is not clear whether they mean "a fielded character die", or "all fielded dice associated with a character card". We must wait for someone to ask on the rules forum, and still longer for WizKids to answer. As for using 2 Phantom Zones in a single turn - yes, you may do that. Last edited by Scorpion0x17; 06-17-2015 at 10:59 AM. The first part of the text clearly reads singularly. Since a character card can't be in the field, it must be referring to a singular character die. You can definitely use multiple phantom zones on the same turn, and all those dice would end up on the card. Then if you use it again on another turn, any dice from a previous turn (and there would only be multiple if you had used it multiple times on the same turn) would go to the prep area. thinking about that, using 2 Phantom Zones dices, select one charater, 2 Aquaman dices, and another character, 2 Batman dices. Do you think "move any dice" seems you can put a couple or more character dices with only one Phantom Zone die? When the game references "a character in the field" it is always referring to a single die. There are times when the game refers to characters "anywhere", and that is when things get confusing, but in the field is pretty clearly a single die. My brain skipped the "in the field" when I read the card text previously. So, yeah, I agree you are taking a singular character die. And actually the latter part of the card text is all singular. Not sure if I should be starting a new thread or not but I have another Phantom Zone Q. If I you use it on a character and in that same turn I damage my opponent, does his character get to come out already? Yep. That's what the second part of the card says. All of these will remove dice from the card and place them in the appropriate Prep Area. Yes, once the effect of Phantom Zone has been activated, any damage to your opponent will release the captured die to your opponent's prep area.